The Phorus PR5 shines with lossless audio over Wi-Fi, but trips over its high price tag and the mandatory, yet limiting Play-Fi app. Whether you're throwing a party or settling in with some tunes, chances are your smartphone will be on its auxiliary leash right next to the speaker system. It's sad leaving your device unattended, and it's no fun hunching over or – gasp – getting up just to be within reach. The $179 Phorus PR5, which is currently only available stateside, utilizes a clever set of technologies that can set your phone free, back into your pocket, and upgrade your speaker system into a wireless setup. The receiver smartly takes advantage of your Wi-Fi connection to stream lossless audio within a smartphone app to your speakers. Being able to rejuvenate technology that you already own in ways you never imagined is amazing, but at $180, is it worth it? 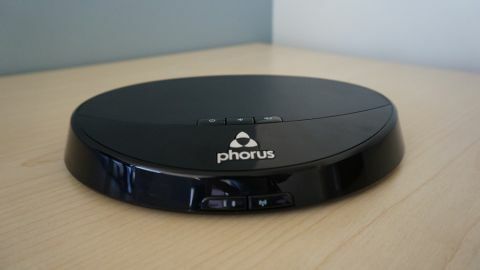 The Phorus PR5 is a thin, attractively designed, oval-shaped device that's no bigger or heavier than a modern router. It's small enough to slide into small spaces in your entertainment center, but it'd be wise to keep it out of cramped spaces. If not just for better wireless signal reach, accessibility to the PR5's handful of buttons will become an issue tuckered away too deep in. Notches on the bottom allow you to wall-mount the receiver, if that's your bag. On the back, receded a bit under the black oval hood, are two ports: a standard 3.5mm auxiliary port and a full-sized USB port. A decently-sized 3.5mm cable is included to strap between the receiver and your device, but if it's too short, feel free to supply your own at whichever length you choose. To accommodate to different speaker setups, Phorus has also included a 3.5mm to RCA adapter. All in all, the PR5 travels lightly, packing no more than it needs to do the job. It gets out of the way so that Play-Fi, a clever app created by DTS, can handle the hard stuff. Available on PC, Android and iOS, Play-Fi is the Wi-Fi-powered command center that gives life to the PR5, and in turn, your speakers. To sync the PR5 to your network, you'll need the mobile app. As of this writing, the PC app can't issue firmware updates to the receiver. Right out of the box, my PR5 needed to be updated, so leave the setup process to the mobile app. While giving your speaker system a new, wireless life, the Play-Fi app's offers quite a few streaming options, including Pandora. If lossless audio is your bag, the PR5 can send locally stored music on your device to the PR5. Oh, and if you try to be sneaky and stream audio from any app that's not in the Play-Fi ecosystem (like Spotify), it will just come out of your phone's puny speakers. Bah! The PC app is more capable, but at a cost. For $14.99, you're granted the features that Android and iOS users are getting for free, sans walled garden. Play-Fi via PC installs as a sound driver and will stream any audio, from any program, to your speakers. After shelling out $179 for the PR5, this seems like a cash grab. The app situation here is more complicated than it should be. If you'd rather sidestep the app, the PR5 receiver supports Bluetooth with full stereo audio via the A2DP profile. Once you've established a connection, you can stream audio from any app to your heart's desire. Just know that it won't be lossless – that feature is saved for the app. Once we got the app and PR5 talking to one another, our experience was golden. Your experience will be soured if the PR5 is too far from your route. I was able to defy this somehow, streaming locally stored music on an Android phone two floors below where the router is in my house. It was great to keep my phone on me, free of any line-of-sight restrictions while I streamed. Connecting via Bluetooth was simple, and I encountered no hitches along the way. It's a great alternative solution if Wi-Fi isn't available, although line-of-sight between your device and the PR5 is crucial. The Phorus PR5 is undoubtedly a cool way to enliven old stereo furnishings. It's design leaves nothing to be desired and it not only won't muck up your well thought-out sound station. It ducks out of the way so the Play-Fi app can get down to business. When synced with the Play-Fi app, it pumps out crystal-clear audio, coming alive with basic Wi-Fi. Play-Fi will only continue to get better as time passes, as will your experience with the PR5. The setup process varies depending on the platform you're using to operate the PR5. The lack of feature parity in the Play-Fi apps and the PC applet turns the setup process into somewhat of a pain. At a steep $179, you're investing in the PR5 under the sole promise that Play-Fi will provide an unparalleled experience. The device undoubtedly manages that by pumping lossless audio. But, right now, limited file and app support in an era of openness is puzzling. Without the app, it's just a $179 Bluetooth dongle for your stereo. For party people and audio enthusiasts, the PR5 does its job well, providing enough reasons to make it worth the price. For everyone else, the app, in its current state, prevents the experience from being persuasive enough to ditch your wired setup.